Choosing the right quantity will save you time and cost, so please do as follows. First measure the perimeter of the room in meters or feet that you like to you install plaster cornice. Then add 10% to the total meters for cuts and corners. If you have a chimney breast or bay windows please add an extra length for the outside corners and cuts. So for example, you room is 22 meters add 10% that = to 2.2 meters. Then add it all together and divided by 2.5 meters to see how many lengths of plaster cornice you will need to order. 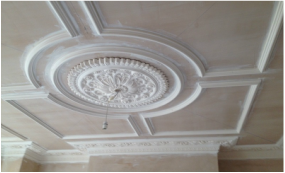 Please note our cornices and coving comes in 2.5 meters long and the reason for is, through the years we have find out that 3 meter lengths are creating more waste and most importantly it is very difficult to move and balance the plaster cornicing, especially when working in smaller areas, such hallways, corridors and bedrooms. If you are still unsure, then please email us a sketch of your room and we will be more than happy to assist.